Students and faculty from the Truman Forensic Union and the Department of Communication recently returned from Beijing, China, and the 12th Annual FLTRP Cup English Language Debating Competition-China’s equivalent of a national debate championship. Students and staff assisted with the tournament while visiting a variety of sites in China. Kevin Minch, associate professor of communication and director of forensics, was in his second year serving as a trainer for the Cup, in cooperation with the International Debate Education Association (IDEA). Christopher Girouard, a senior from Chesterfield, Mo. ; Mark Buchheit, a junior from Carthage, Mo. ; Kristopher Stroup, assistant professor of communication and interim assistant director of forensics; and Elizabeth Clark, communications department chair and former forensics director; served as Independent Adjudicators for the Tournament. The event took place in the aftermath of the tragic Wenshan earthquake in China’s Sichuan Province. Among the more than 120 Chinese teams present at the event were several teams who struggled to reach the tournament through earthquake devastated territory. Truman’s involvement in the Cup is a first step toward the development of a broader initiative to involve Truman forensics students in regular international forensics opportunities, including tournaments, conferences, and outreach activities. At least three possible exchange initiatives are under discussion as a result of the event. Truman State University has been awarded a $600,000 NSF Scholarships in Science, Technology, Engineering, and Mathematics (S-STEM) grant. This is a four-year grant that will provide scholarships for students with financial need who are mathematics or computer science majors. The goals of the project are to 1) recruit and retain academically talented, financially needy math and computer science majors and 2) increase the number of mathematics and computer science graduates who enter the workforce in these fields. In addition to the scholarships, support services including tutoring, mentoring, career placement assistance, and interactions with business and professional individuals will be provided. The project PI is Dana Vazzana, associate professor of mathematics, and CO-PIs are Alan Garvey, associate professor of computer science; Eric Howard, professor of mathematics; Robert Matthews, assistant professor of computer science; and Jason Shaw, visiting assistant professor of mathematics. The conference featured competitive events for individuals and teams, various workshops for training, and election of officers for the next year. Alicia Stewart, a history major from Clinton, Mo., served as National North Central Region Vice President for the 2007-2008 year. 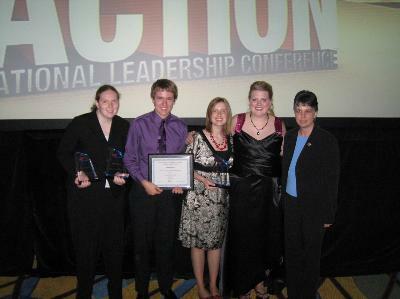 Cathy Poyner, instructor in business administration, was recognized as Missouri Outstanding Local Chapter Adviser. The Truman State University Chapter also received the Gold Seal Award of Merit. Several Truman students were recognized at the Awards Program. Amy Rowden, an economics and business administration double major from Dixon, Mo., received first place for Financial Analysis & Decision Making and International Business. Jonathan Arnold, a pre-business administration major from Gallatin, Mo. ; received first place for Employee Training & Development. Marissa Chaplin, an exercise science and pre-business administration double major from Warrensburg, Mo., received fifth place for Sports Management & Marketing. Stewart, National North Central Region vice president, was named as one of the people in Who’s Who in Phi Beta Lambda. Phi Beta Lambda is an educational association of postsecondary student members preparing for careers in business. There are more than 11,000 active members in the United States. Monday-Thursday • 7:30 a.m.-8 p.m.
Friday • 7:30 a.m.-5 p.m.
Monday-Friday • 9 a.m.-7 p.m.
Saturday • 11 a.m.-2 p.m.
Friday • 8:30 a.m.-11:30 a.m. The Kirksville Area Chamber of Commerce has been working with area businesses and organizations to put together an amazing celebration. There will be events for several days. People should bring their lawn chairs and blankets, family and friends to enjoy the celebration. View the schedule of All-American Red, White and Blue Festival activities at http://www.kirksvillechamber.com. For more information, contact the Kirksville Area Chamber of Commerce at 665.3766. Proceeds from these events benefit the fireworks and the festival. All 12 of the proposals submitted through the Center for Teaching and Learning were funded as well as one proposal that was submitted independently. The efforts of these faculty members will bring $7,000 to Truman in 2008-2009 to support 13 service-learning projects. In the past, Truman secured $4,000 per academic year from the Missouri Campus Compact. The next issue of the Truman Today will be published July 15. Truman Today is published biweekly during the summer session. Submissions for the next issue are due by July 9 to truman.kbest@gmail.com. Sodexo invites members of the Truman community to attend barbecues on the Mall this summer. The remaining dates are July 11 and 25. The Financial Aid Office is hosting a retirement reception in honor of Sue Neely from 2-4 p.m. July 25 in the atrium of McClain Hall. Please take a few minutes to join Neely for refreshments and reminiscing. She has been at Truman for the past 35 years.